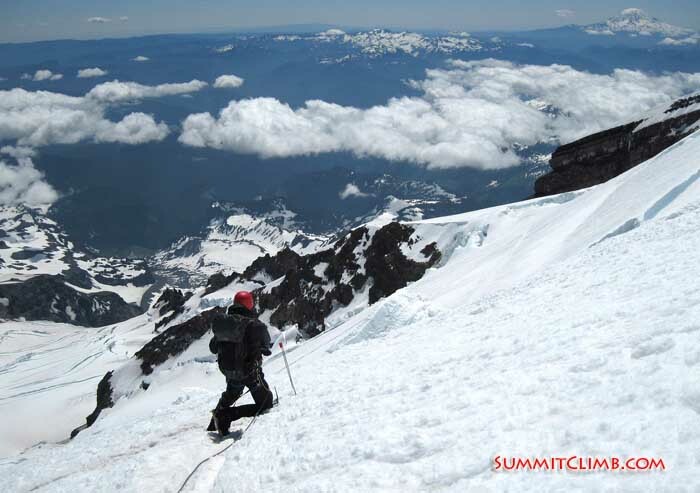 Trip Summary: Each year SummitClimb and SummitTrek offer a free, no cost www.SeattleGlacierSchool.org in the 4,500 metre / 14,000 foot high mountains near Seattle (the most glaciated peaks in the continental usa) for men and women of all ages from around the world. It's an opportunity to meet expedition leaders and climb together with friends new and old, while practicing climbing techniques used in ascending the high peaks of the world, such as www.AconcaguaSummitClimb.com , www.EverestGlacierSchool.com , www.EverestTrainingClimb.com , www.BaruntseClimb.com , and on www.EverestClimb.com . 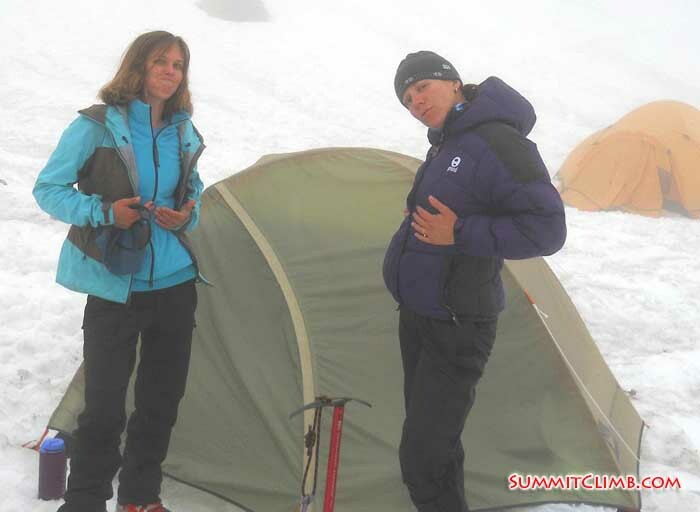 By the way, SummitClimb and SummitTrek also offer a European mountain school in prepararation for Everest, in the French Alps each February and March at www.AlpsMeet.com , so please join us for that free of cost, no charge climbing camp as well. 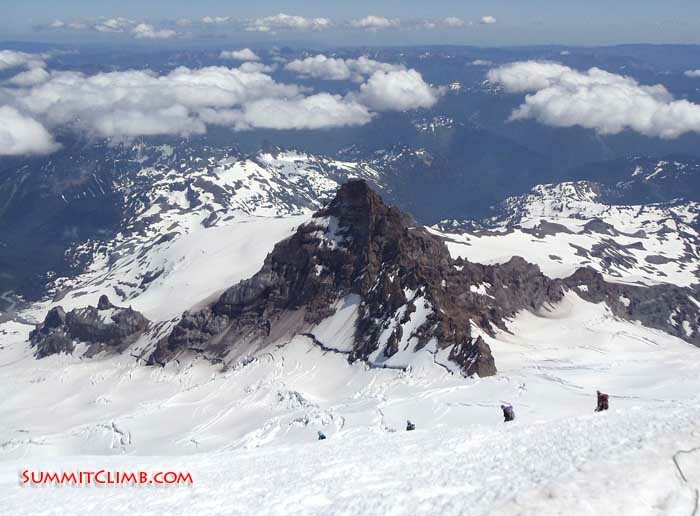 At 4,500 metres / 14,000 feet the largest glaciated mountains in the continental usa stand near Seattle and rise dramatically out of the ocean. The last week in July brings a mixture of weather including mist and brilliant sunshine to these icy slopes and our successful group enjoyed all of it. Our diverse team of women and men of all ages from around the world met in a small town near Seattle to participate in the glacier school. 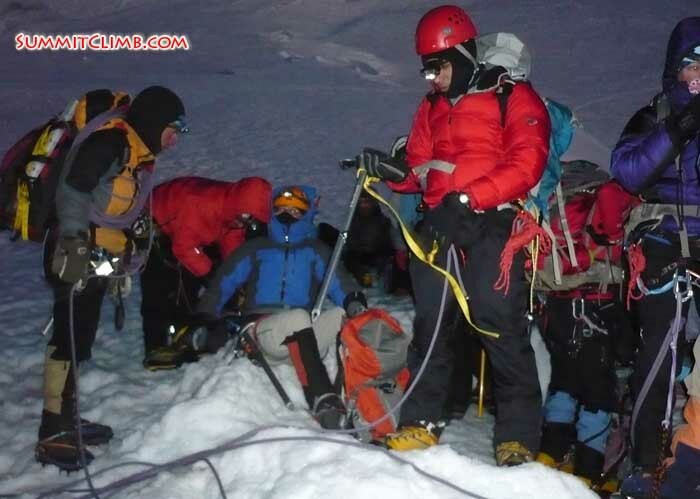 Experienced climbers shared their knowledge and beginners tried out mountaineering and met new climbing friends. 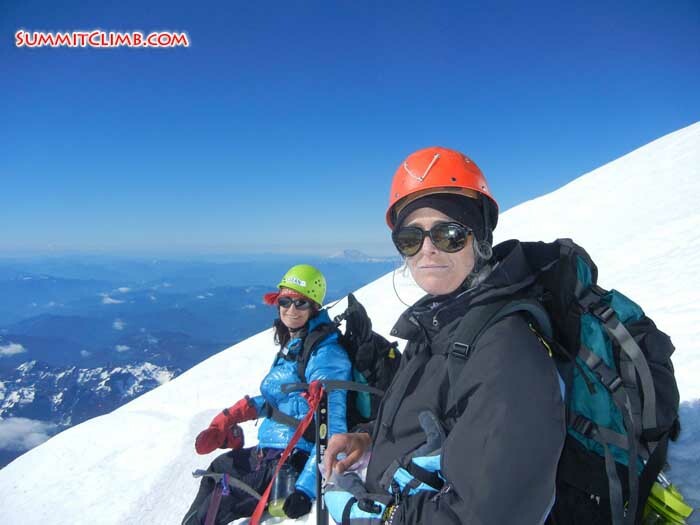 After camping on the snow for 4 days, our members put their skills into practice by climbing to the summit of the peak on an exciting clear sunny day. 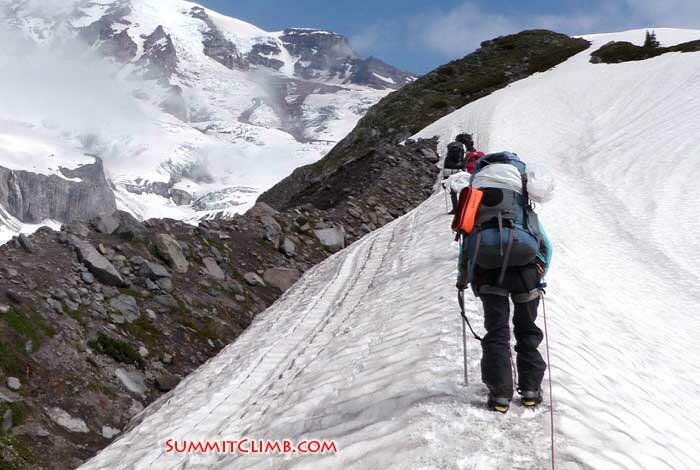 The group started in a small town near Seattle, where everyone broke out their gear on one of SummitClimb's leaders lawns, then went to one of Seattle's excellent inexpensive equipment stores to buy, rent, and hire the clothing, tools, and supplies needed for the climb. 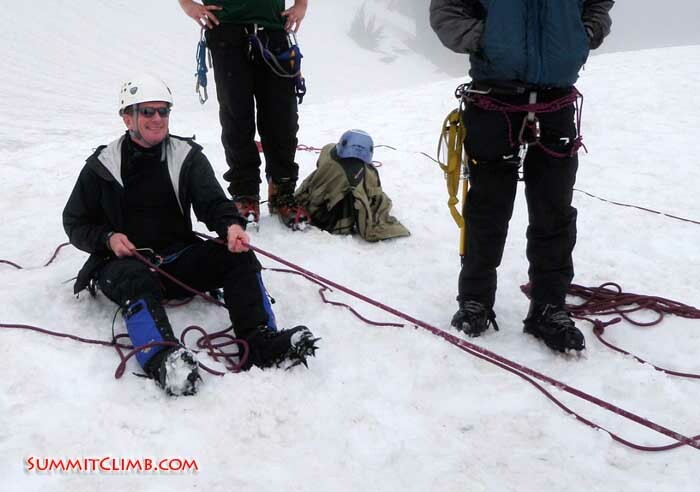 Scott Patch, Bill Dwyer, Stewart Wolfe, and Dan Mazur worked together to lead the Seattle Glacier School. 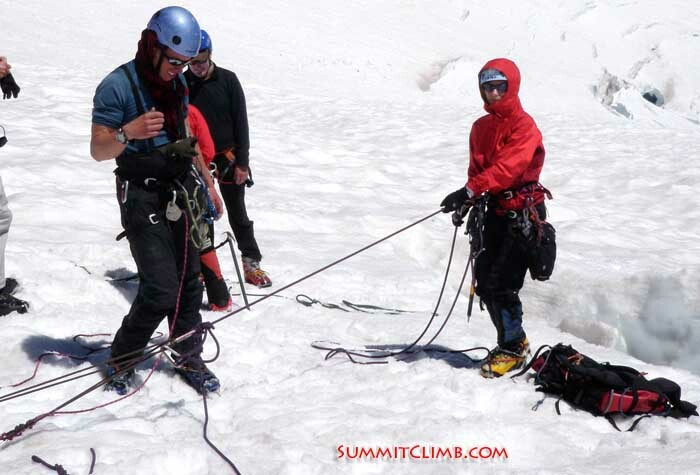 They coordinated the group through building snow anchors, walking on a rope team, ascending out of a crevasse, and self arresting. 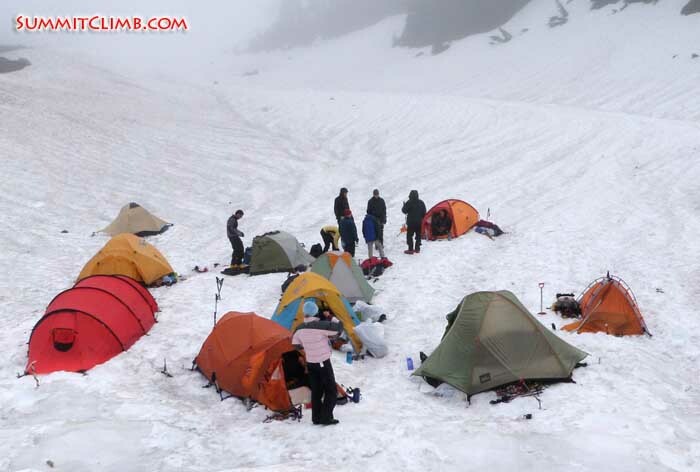 The group camped together cooking meals and sharing stories while enjoying incredible mountain scenery. Leaders and members swapped knowledge on equipment, climbing, and glacier travel techniques through open discussion and classes giving everyone an opportunity to learn. 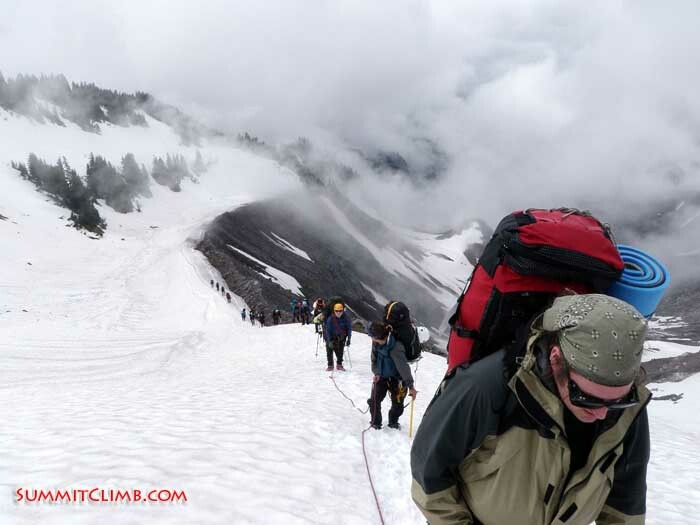 The team finished the school by climbing the moderate glacier climb to the summit of an icy volcano near Seattle. 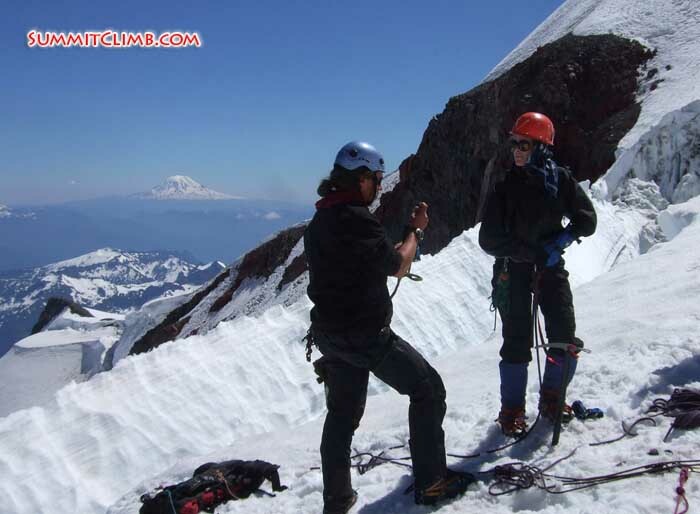 This volcano is not extremely difficult to ascend, but it is considered to be the most glaciated mountain in the continental usa, and is excellent preparation for higher mountainsd such as Aconcagua and great training for Everest and the Himalaya. 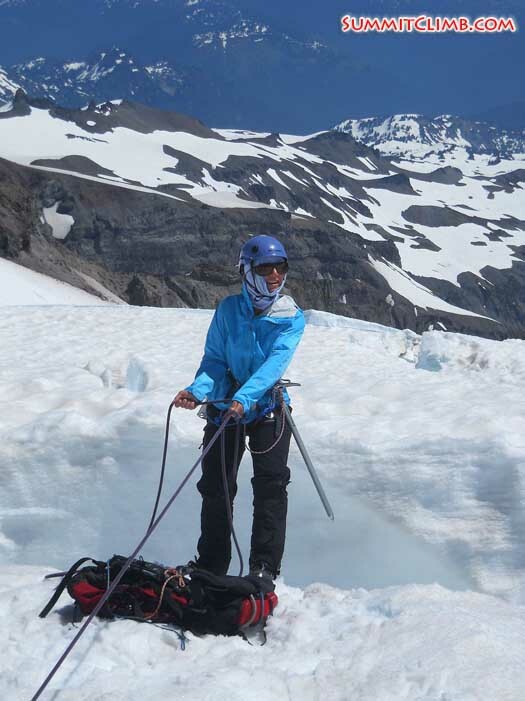 Throughout the glacier school, members learned and perfected their mountaineering and snow camping techniques, then were able to apply their new skills as they helped one another to the summit. 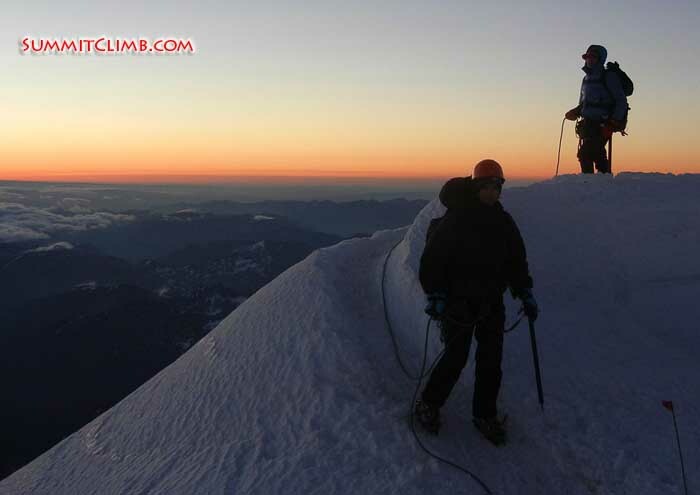 Alpenglow covers participants as they ascend above the clouds during a terrific sunrise (Allen Smith). As she summated volcano, Erika realized she had come a long way since then. The large cirque, blanketed by white stood strong and silent as the wind swirled throughout it. Erika had climbed mountains before, but none as large or technical as this. She was not alone on top though, in fact the group, united by a rope, was extremely diverse. Another member, Abhi Anchliya, who is originally from tropical West Bengal India and now lives in Houston Texas, arrived off the plane in Seattle, with very little equipment and only a small idea what he was getting into, but a fully packed positive attitude. 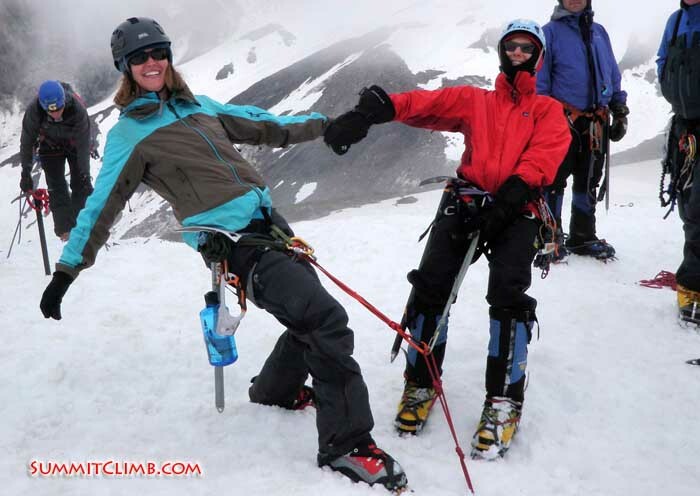 He had never been in the snow before and now he was successfully climbing a glacier with Erika. 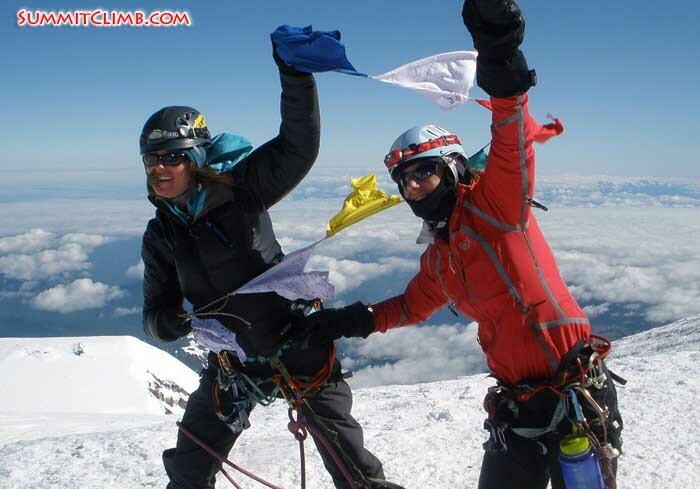 Ulyana and Ania wave flags on a breezy summit day (Charlie Roberts). Erika looked down at the rest of her team waiting in the crater. Jennifer, a tall acupuncturist with curly brown hair from Myrtle Beach South Carolina, a couple, Dale, a 60 year old investment manager from Alberta Canada, and Ulyana, a young glaciology student from Boulder Colorado, the various members of the team united by a rope and working together like a machine. 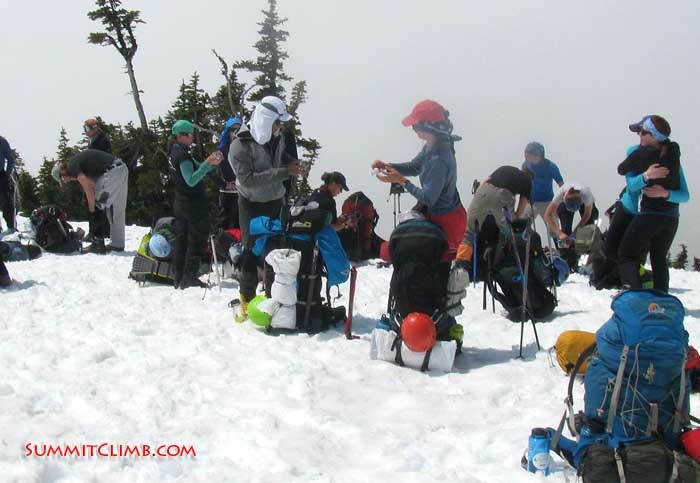 One week ago none of them knew each other, nor had stepped on a glacier, and none of them realized that they would be summitting the most glaciated mountain in the lower 48 states by the end of the week. 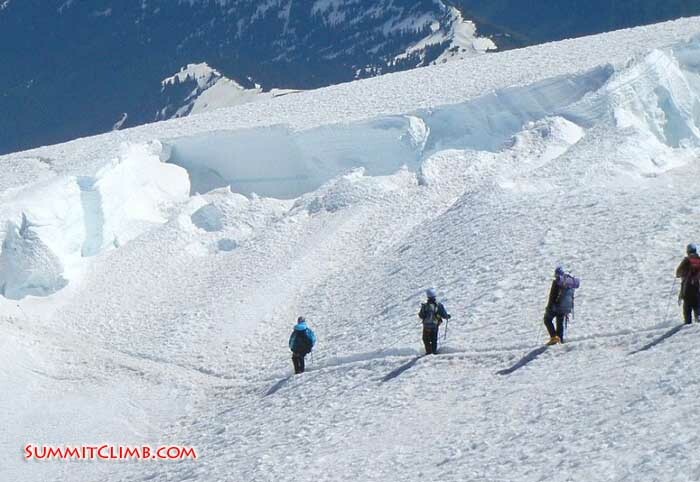 The massive glaciers stretch out below the summit as the members of the Seattle Glacier School descend the ridge back to high camp (Scott Patch). 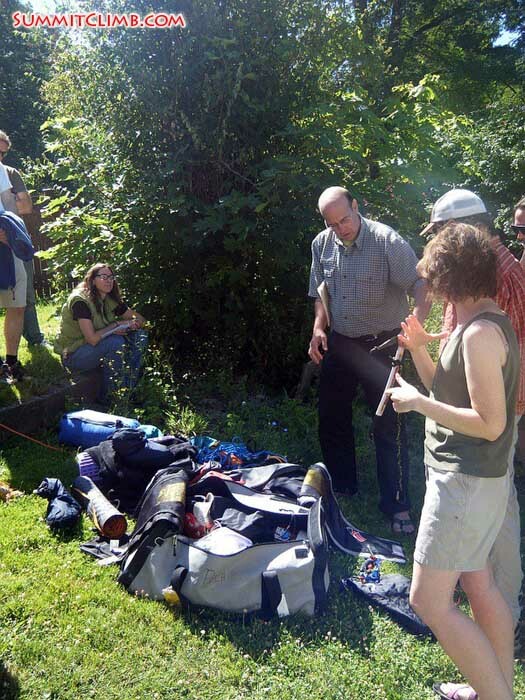 Expedition leader Dan Mazur gives advice as he goes through personal equipment with participants. Jen and Tracy look on (Rick Eng). Tucked below the hustle of Seattle and the aroma of Tacoma, lies the often overlooked capitol of Washington State, Olympia. Sitting beside the ocean is a small cottage with white wooden trim. The decor of the house reflects the eclectic personality and adventurous history of the people that pass through it. Tibetan tapestries cover doorways, a topographic map of Everest National Park hangs in the living room, and piles of mountain equipment line the basement walls. “I don’t spend a lot of time here. It is a great place, but I am away half the year. Except there is no place in I would rather be in the summer than here, its beautiful here” says expedition leader Dan Mazur. He comes through town to help set up the glacier school, but between Himalayan adventures, and lets participants of the school stay in his backyard, but there isn’t a lot of time for relaxing on the beach. Dan has to duck when he walks through the doorways of the cottage, he keeps to himself, but his humble demeanor contrasts characteristics of a man who has done technical routes up K2 and summitted Everest. Heather gets the car ready for the caravan to the mountain (Heather Jennings). Leaders from Summitclimb, started the day by going through the each member’s equipment list (that they got on Seattleglacierschool.org) on the front lawn. The group and helpers pieced through the gear on the lawn, talking about personal preferences with each other and explaining uses. 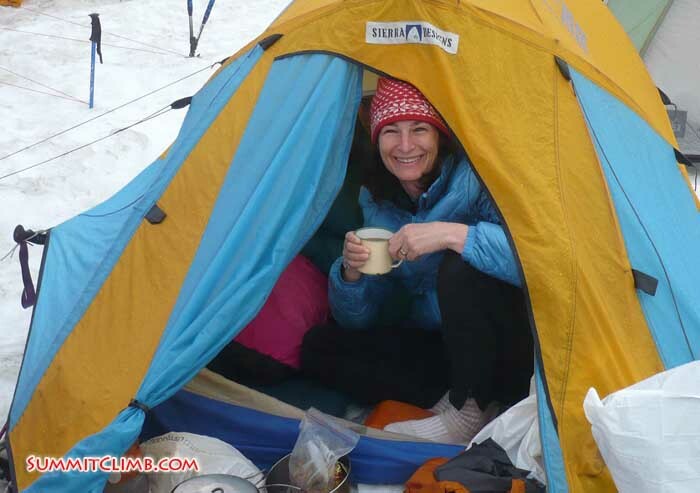 The expedition leaders drew on their Himalayan knowledge as they explained what people needed to be comfortable while sleeping on glacier ice. 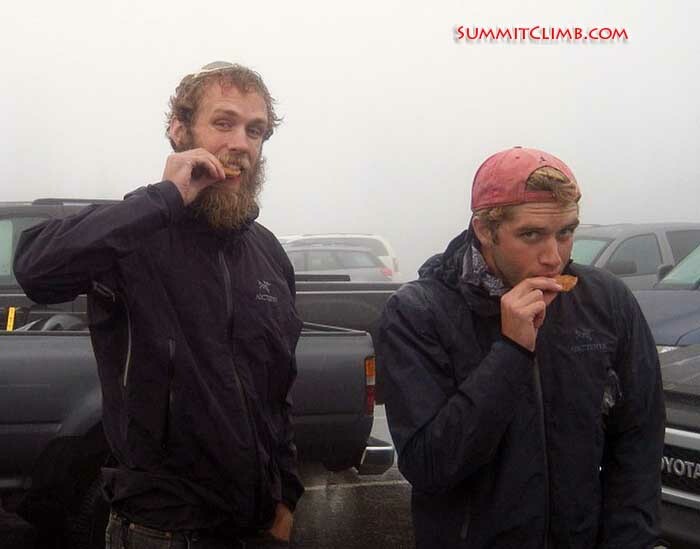 Brothers, Wes and Kyler, enjoy fresh baked goods while the group gears up in the parking lot (Rick Eng). 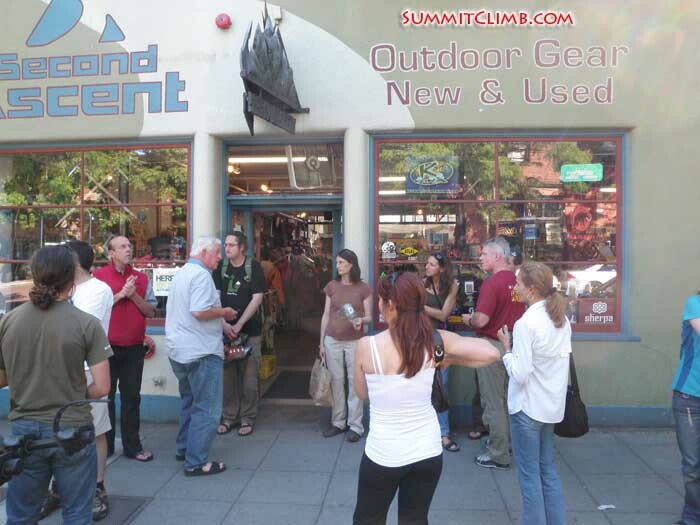 Members get ready to fill the needs at one of Seattle’s great equipment stores, Second Ascent (Anna Moll). The conversations and laughs over breakfast and coffee continued as they drove from Olympia North to Seattle. Seattle has a plethora of reasonably priced equipment stores and rental shops, making it a great location to fill in the blanks on gear lists. Piles of new and used supplies were made on the counter for the people new to the sport. Most just needed to rent / hire some plastic boots and get some spare batteries, but were happy to help the others find what they needed. The crowd filed through Second Ascent new and used mountain equipment shop finding all kinds of used treasures, asking questions, and renting boots. What holes couldn’t be filled there were found at Recreational Equipment Incorporated shop, one of the oldest and most famous outdoor stores in the U.S.
By the end of the day people had gotten what was needed to ascend the mountain and met at a local German restaurant for one last tasty meal before take off. A celebration at the end of a long day of shopping was a good way to kick off the start of the climb. Starting to rock and roll! 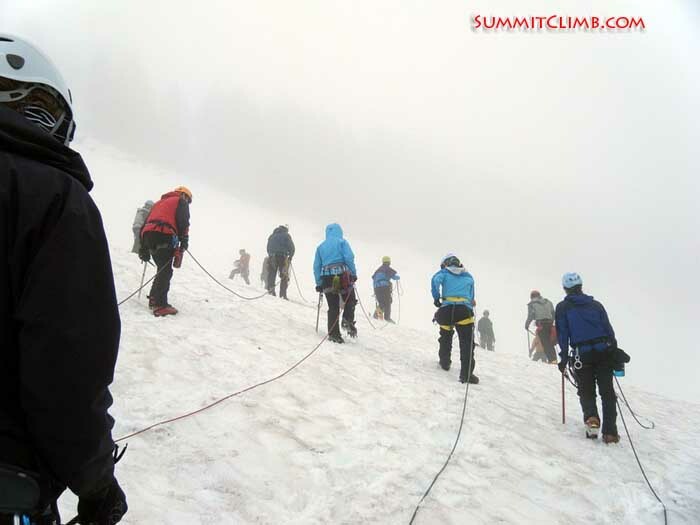 Members line up in the parking lot, ready to begin the ascent. From the left, Dan, Rick, Heather, Tracy, Stephanie, Jen, Erika, Dale, Allen, Jeff, Maryana, Charlie, Anna, Randy, Kyler, Wes, Bill, Ulyana, Vance, Stewart, Abhi, Sonya, Brian (Scott Patch). The large glaciated mountains towering out of the Pacific Ocean average 44 inches of rain annually, which often makes for a cloudy start. The beginning of the trip was no exception. 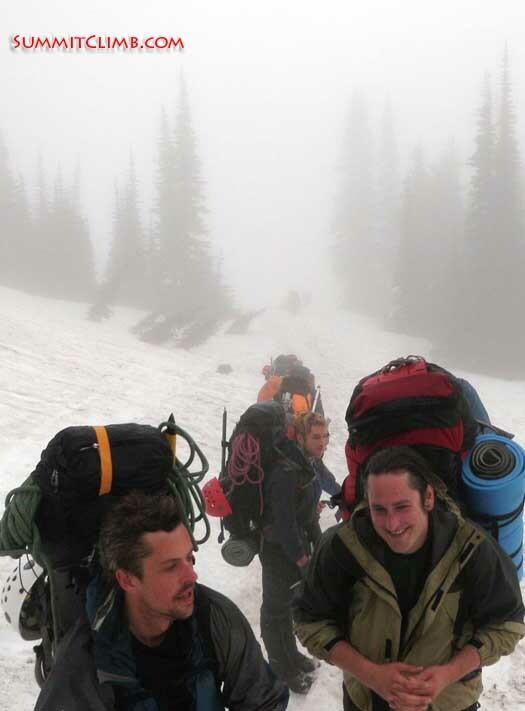 The group awoke in Olympia and caravanned towards the mountains ascending to the parking lot in the clouds. On their way they stopped at a grocery store to buy their food for the week and grab a quick breakfast. The mist clung to the trees condensing on the moss as it dripped along the road. The staging area was the highest parking lot on the mountain, and due to the late winter, the cars parked next to large snow piles. With climbers from cities like London England and Los Angeles, it was a weather shock from summer temperatures. The rain in the Pacific Northwest has a tendency to be passive aggressive, in that it never really lets it all out but still lets you know it isn’t letting you get away dry. Participants balance their rope teams on the snow slopes beside camp (Rick Eng). 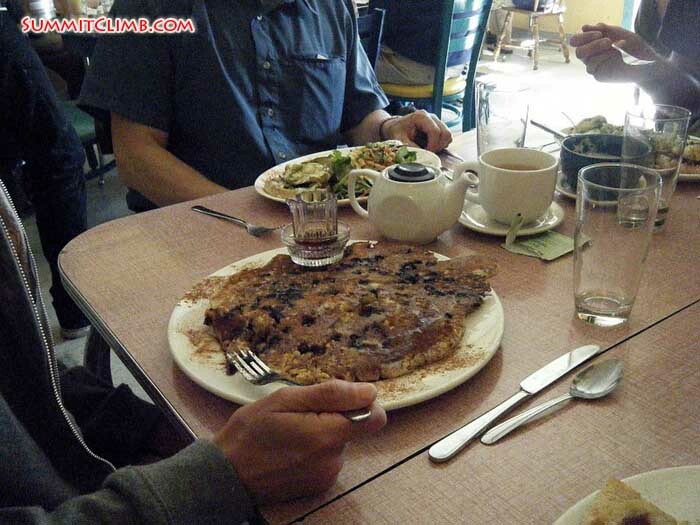 Starting the climb off right with some of the biggest pancakes that the Northwest has to offer (Rick Eng). Our first camp sits in the mist and serves as an excellent location to stage our school (Anna Moll). Heather and Ulyana model their jackets outside their warm new home (Ulyana Horodyskyj). 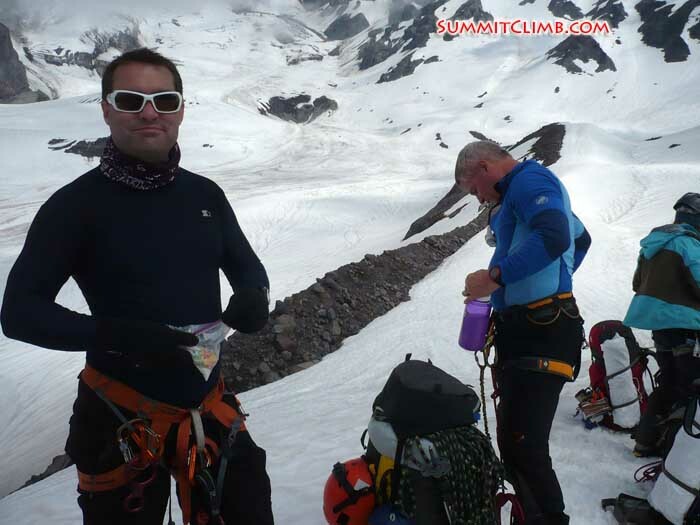 Stewart and his brother Vance, chat as they ascend to high camp with Kyler in the background (Anna Moll). Stephanie warms up with a hot drink while she gets ready for classes (Heather Jennings). Leaders Bill and Scott go through the hip-belay technique on a slope outside camp as Tracy looks on (Rick Eng). Dan Mazur helps expedition leaders, Stewart and Patch, get ropes ready for school (Stephanie Barbee). Over breakfast, the expedition leaders stretched ropes out onto the snow within camp, ready for some practice after a lesson on team management. Keeping a rope team balanced is something that even the most experienced climbers struggle with on expedition, but with practice, it becomes an instinctual technique. “The big thing I took away from the school was the roped travel,” Charlie, a climber and tri-athlete from Nottingham England stated after the school. 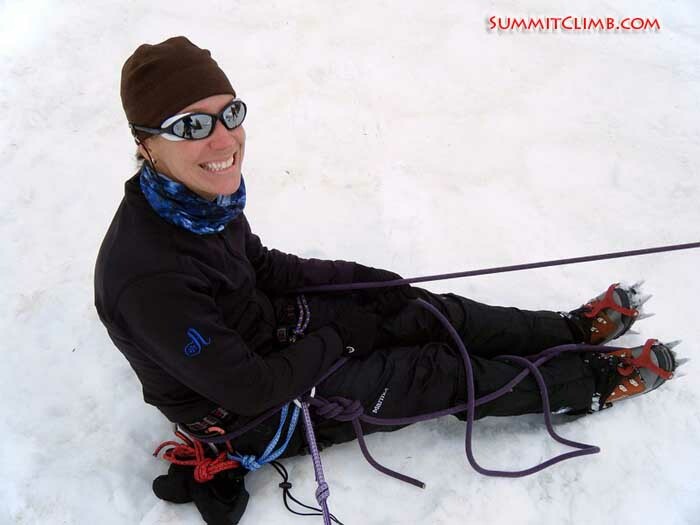 “Having practiced rope travel and used crampons in New England, I thought I understood it but it wasn't until I got onto the mountain that the understanding and fine tuning of the techniques became so important and made a huge difference.” People quickly learned that keeping tension on the rope and walking within a team required a lot of concentration, and the distractions of glacial vistas were there to tease as they walked along the moraine. Members get ready for their first day of snow school by putting on sun block and having fun with their new friends (Allen Smith). Jeff and Allen, equipment experts, sort through their things during a break in classes (Heather Jennings). Ulyana and Anna, new friends, make each other laugh with their new equipment (Anna Moll). Ulyana and Anna test their knowledge by putting their weight on the snow anchor that they built (Anna Moll). Randy works on his hip-belay technique as he helps a fellow participant climb up the slope (Anna Moll). 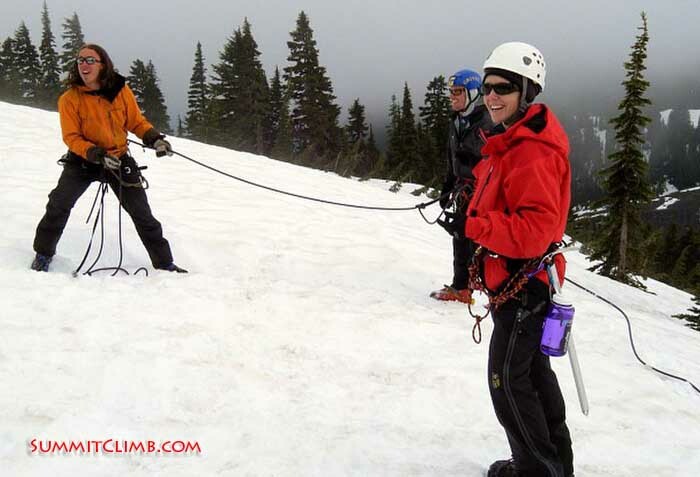 Heather casually holds another participant with the hip belay while anchored to the snow (Rick Eng). Members ascend the moraine towards high camp as the veil lifts off the face of the mountain (Anna Moll). Stewart leads his rope team along the moraine out of camp one as the trees begin to fade away (Anna Moll). Jen and Bill take a break on the glacier moraine to put on their sun cream while they move to high camp (Heather Jennings). 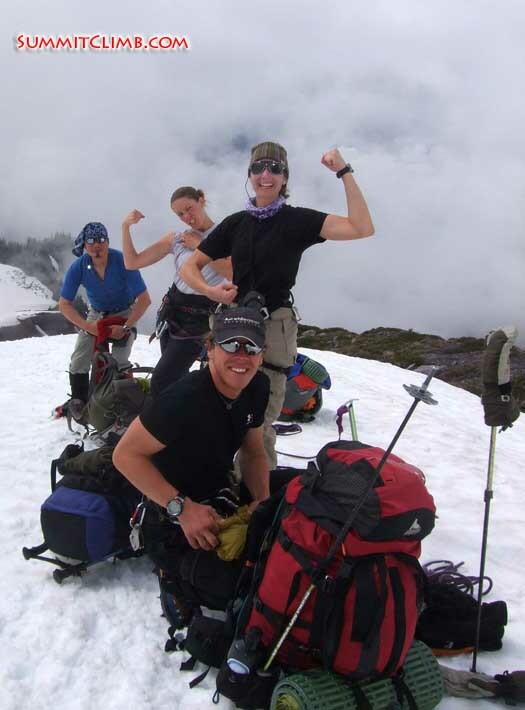 “Sun’s out Gun’s out!” Bill, Heather, Jennifer, and Rick strike a pose on their way to high camp (Stephanie Barbee). Many of the members took their time with the hike up to high camp in order to take in the panoramic views of the surrounding area. Mt. Adams, St. Helens, and Mt. Hood all made an appearance on the horizon for climbers, and as the sun dropped into its orange bed, the cascade giants morphed into a changing array of colors. 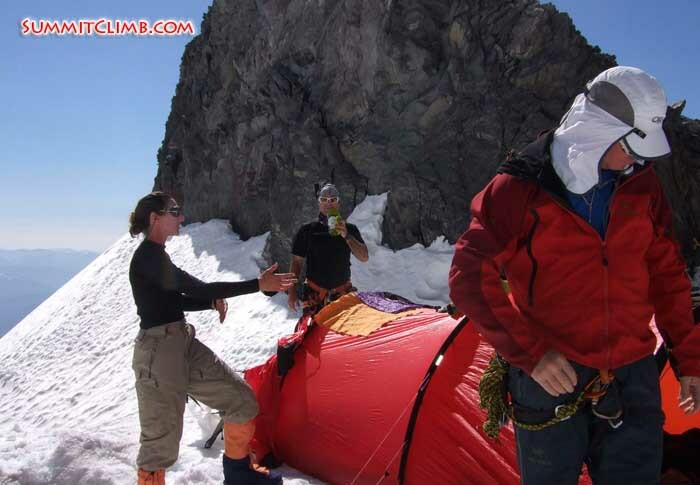 Jennifer helps Jeff and Allen get ready for the day outside their tent (Stephanie Barbee). Heather Jennings uses her ascender to pull herself back to the surface during self rescue practice (Heather Jennings). Leaders, Dan and Bill, enjoy scouting out a potential slope for snow school outside camp (Heather Jennings). 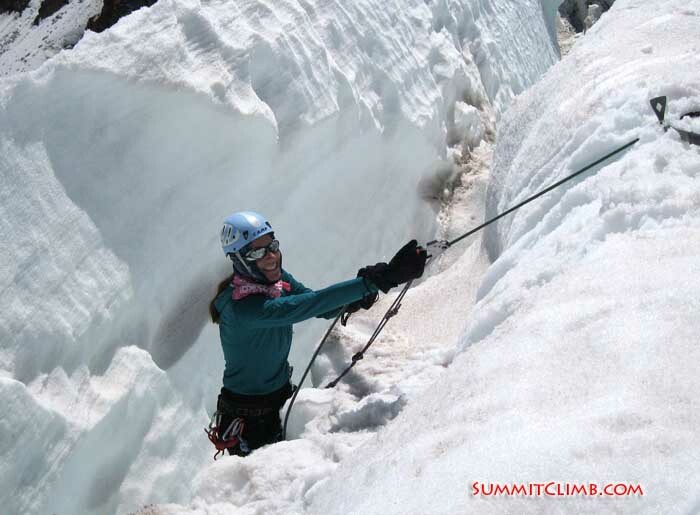 Anna prepares to lower into a small crevasse outside high camp. While Bill Dwyer, expedition leader, looks on ready to help(Anna Moll). Bill Dwyer, explains the use of a mechanical ascender to Erika Schreder as she gets ready to practice in the crevasse (Stephanie Barbee). 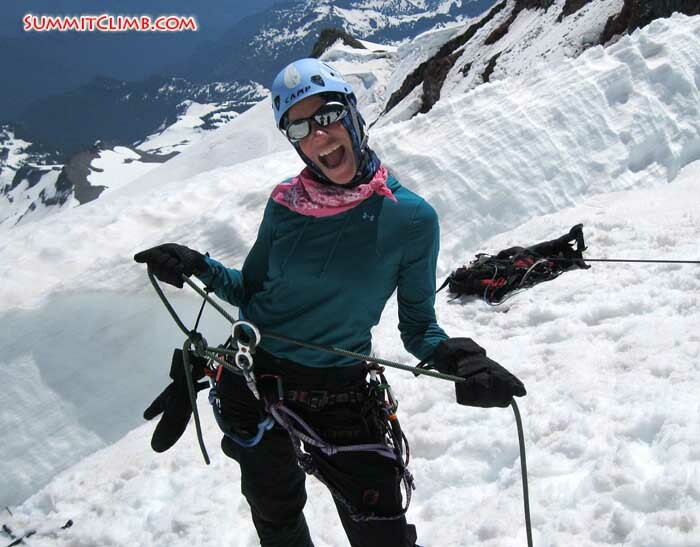 Maryana smiles as she tests her snow anchor before lowering herself into the small crevasse (Ulyana Horodyskyj). 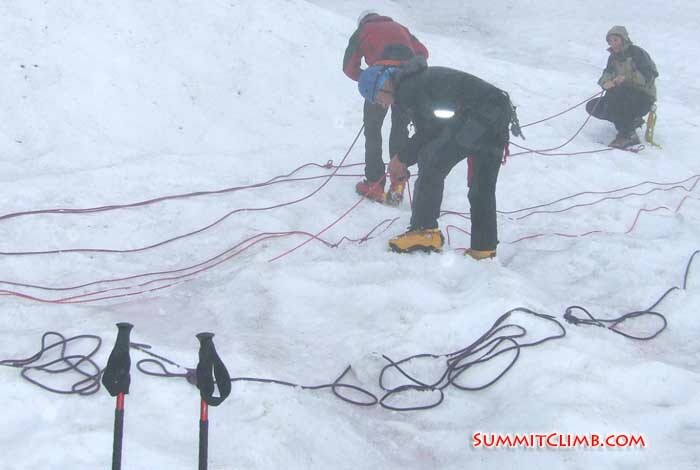 The self-arrest technique on snow is something that climbers need to do without thinking. 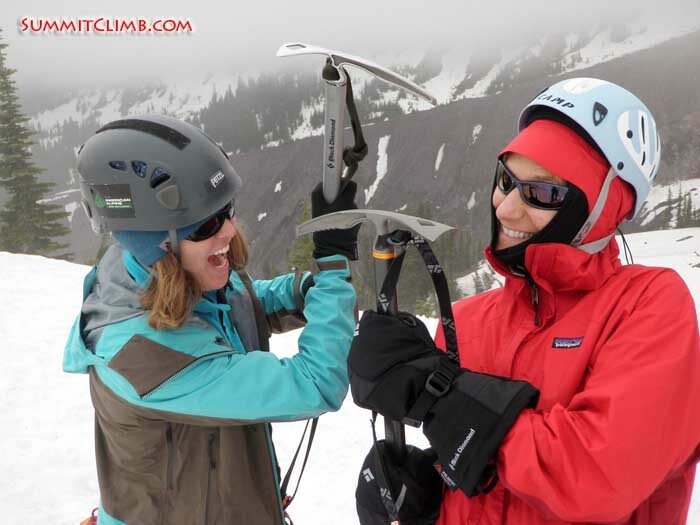 With practice, the act of slamming the pick of an ice axe into the snow and keeping your team from sliding down the mountain is instinctual. For this group it was a brand new experience, but they caught on quickly. The exciting day seemed full, even though it ended early. Many people wanted to continue the practice late into the afternoon, but participants needed to melt snow for filling bottles, and it was not going to be long before they were waking up yet again, for what was to be a very long day. Erika and Stephanie walk on the upper glacier as the sun begins to rise (Scott Patch). Jeff and Allen, equipment experts, sort through their things during a break in classes (Heather Jennings). 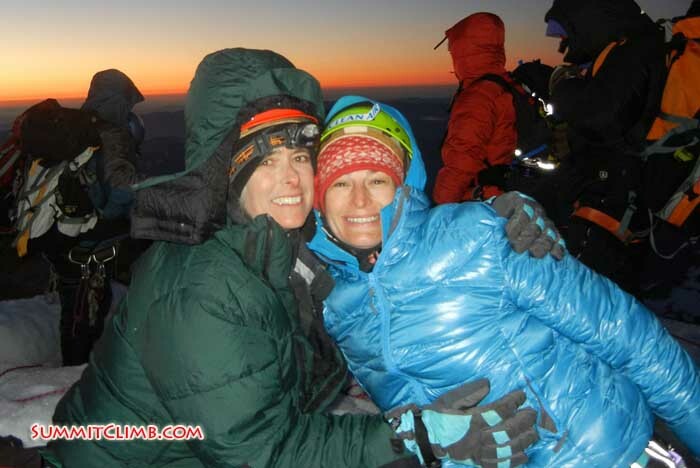 Erika and Stephanie, friends from Seattle, smile as the sun begins to rise on their summit bid (Scott Patch). 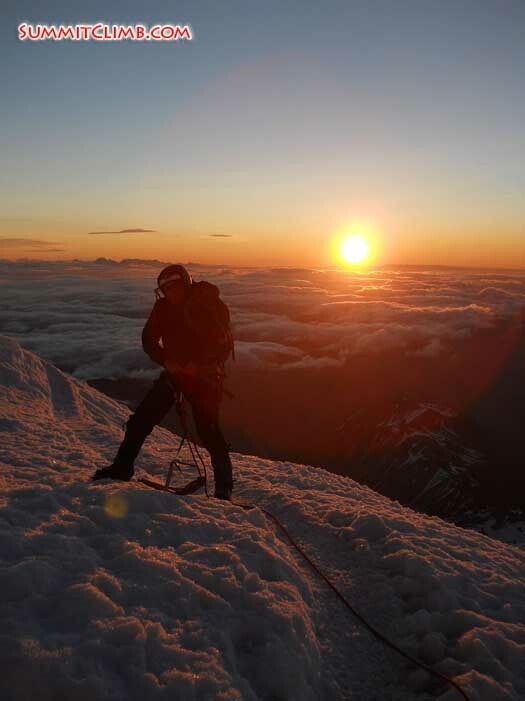 Randy takes in the dramatic alpenglow as he ascends towards the summit (Ulyana Horodyskyj). 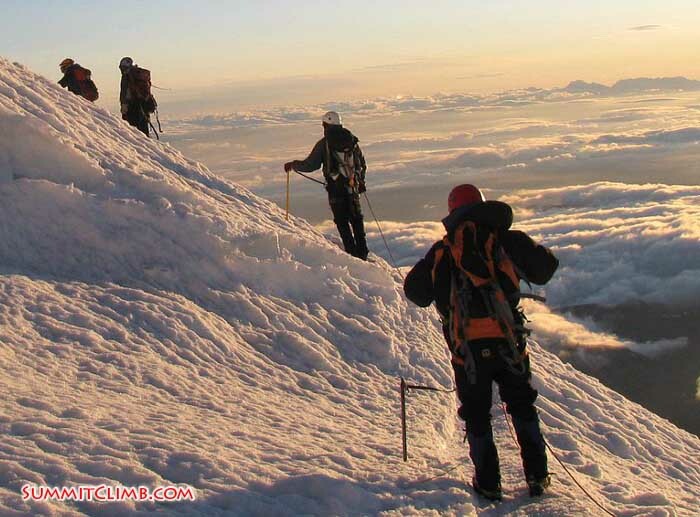 As the other climbers began to drop over the crater rim and onto the summit they all came to the realization of just how far they had come in one week, free of financial cost and full of fun. The skills learned will stick with them forever, and the view is something they will never forget. Abhi looks out at just how far he has come on the slope leading to the summit (Heather Jennings). 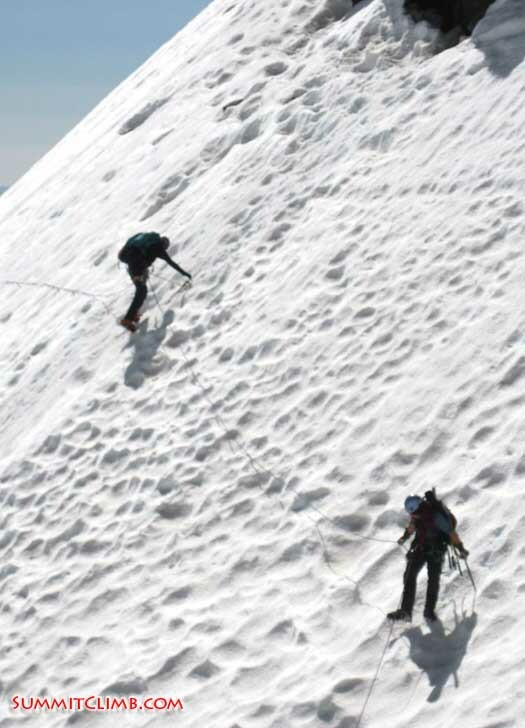 Participants traverse along the long snow slopes to the lower mountain after spending time on one of the most glaciated peaks in the United States (Scott Patch). 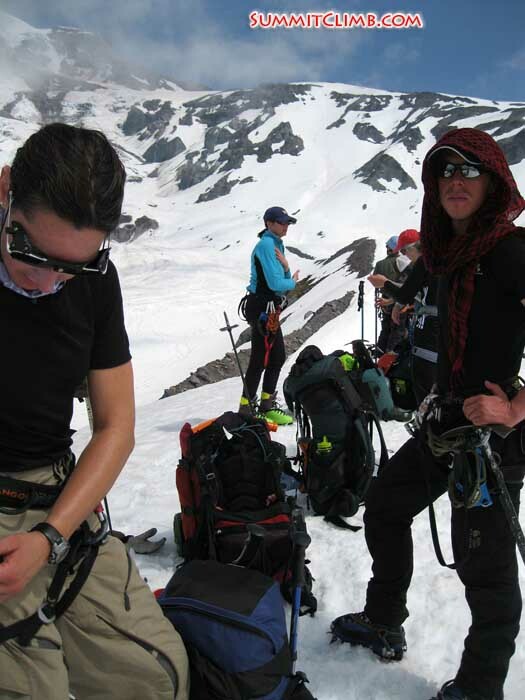 Climbers stand on a sunny summit after a successful ascent. From Left to Right, Randy, Ania, Ulyana, Kyler, Abhi, Jen, Charlie, Heather, Wes (Charlie Roberts). Wes takes in the alpine views on his descent after a successful summit (Ulyana Horodyskyj). Erika and Stephanie take a break in the morning sun on their way back down from a successful summit (Scott Patch). I know that I am not alone in this experience. 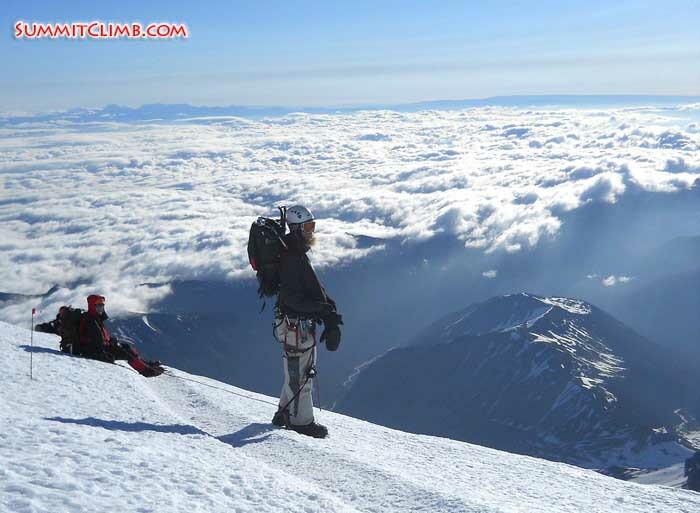 Many climbers taste the sweetness and yearn to get back to the hills. Charlie, the climber from the U.K. wrote me later, stating he is, “already planning a trip with a few folks from the school.” After the practice with the glacier school I am sure that they will. It is amazing that so many people had this experience from so many different occupations, united on top of the mountain for one week, all for the purpose of embracing adventure and fun. At times climbing mountains can seem like a paltry action, but when I see a team of strangers unite, I wonder if it might be the most important thing that we do. Abhi Anchliya – India / U.S.A.
Ulyana Horodyskyj – Ukraine / U.S.A.
Ania Moll – Poland / U.S.A.
Charles Roberts – U.K. / U.S.A.